Shrub of the family Caprifoliaceae (Glossy abelia, Viburnum, Kolkwitzia, Honeysuckle, Elder, Weigela). Habitat: Kolkwitzia prefers a cool and siliceous soil and appreciates sunny position. It is well acclimated in all regions of France. Shape: somewhat entangled fine and flexible stems and bending downward. Deciduous foliage. Opposite and simple leaves, obovate and acuminate, dull green which lights up in autumn with red-purple. Flowers: 5 petals pale pink, in trumpet, clustered and abundant (the Kolkwitzia is called "flowering"), from June to October. 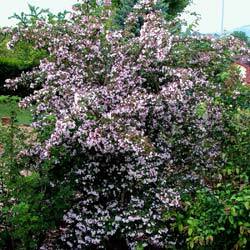 Use: Kolkwitzia is a beautiful decorative shrub hedge, border or mass. Flowering habit does enjoy gardening. Selecting "Pink Cloud" is the most widespread. The flower is pink. Reproduction: do not use the seeds which will give plants with little flowers. Kolkwitzia reproduces by separating suckerses or by cutting. Maintenance: after blossoming, prune Kolkwitzia a bit to give it a bushy shape.